NHPC Recruitment 2019 - Apply Online for 36 Apprentice Posts in NHPC, Kullu, Himachal Pradesh on Apprenticeship. 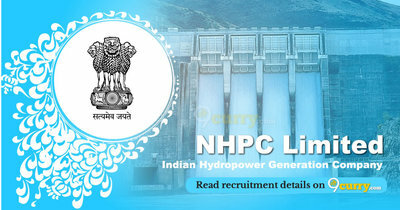 Online Applications are invited by NHPC Limited - Indian Hydropower Generation Company from 05 Apr 2019 to 10 May 2019 till 05:00 PM for 36 vacancies. Electrician/ Welder/ Fitter/ Machenic/ Fireman/ IT 36 For Electrician/ Welder/ Fitter/ Machenic/ Fireman- 10+ ITI in relevant Trade. Eligible candidates may apply online at NHPC's website (direct link is given below) from 05 Apr 2019 to 10 May 2019 till 05:00 PM. After applying online applicants need to send the hard copy/print out of online application form along with all relevant documents to Deputy General Manager (Human resources), NHPC Limited, Parvati-III Power Station, Gram- Bihali, Post Office- Laraji, District- Kullu, Himachal Pradesh, Pincode- 175122. The application with all relevant documents should reach on or before 10 May 2019 till 05:00 PM.